Summer is the season for family cycling, and a new Limar bicycle helmet is an investment that will be enjoyed both now and when cooler temperatures arrive to herald the return of fall. Thanks to Limar, the Helmet Specialist, cyclists of any age will remain safe and protected while sporting the world's most innovative headgear! With comfort and performance as its constant goals, Limar plans and designs each of its kids, youth, and sport action helmet lines to guarantee excellent functionality and exclusive style to cyclists around the globe. These Limar helmets feature the company's In-Mould production process, allowing for a great reduction in helmet weight while ensuring tremendous strength, security, and impact resistance. The Super System micrometric sizing wheel is light and easy to adjust for a perfect fit. The Cool Comfort soft pads inside each helmet are ergonomic, anti-allergic, and absorbent, while the specially shaped air vents are designed to help keep your head cool. Limar's 149 Kids Helmet is the most innovative children's helmet currently available. It features a strong and lightweight (230 grams) construction, offering tremendous protection for young necks. This helmet is amazingly comfortable, and comes equipped with eight air vents, insect nets, and a pinch-safe strap. The helmet is unisize, fitting heads from 50 to 57 centimeters (approximately 19 to 23 inches), and is available in two fantastic styles: Fairy and Camouflage. MSRP: $51.99. The aggressive-looking Limar 510 Youth Helmet is designed to protect the head of a growing child. It includes an integrated front visor, insect net, and ten air vents. Its unisize construction fits heads from 50 to 56 centimeters (approximately 19 to 23 inches). This helmet is super light at just 250 grams, and is perfect for all types of riding and inline skating. 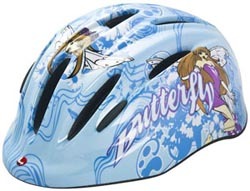 The Limar 510 Youth Helmet is available in three fun styles: Pink Butterfly, Flame, and Black Skulls. MSRP: $54.99. Also excellent for bike riding and inline skating is the Limar 520 Sport Action Helmet. Its robust and lightweight (260 grams) design features a fit-in front visor and insect net, giving the helmet a subtle yet strong appearance. Ten air vents allow optimal airflow, while the large size fits heads from 55 to 61 centimeters (approximately 21 to 25 inches). This helmet is available in four brilliant colors: Carbon, White, Red White, and Blue White. MSRP: $54.99. Perfect for both road cycling and mountain biking, the Limar 575 Sport Action Helmet features large front and rear air vents (24 in all!). At just 270 grams, this helmet is extremely lightweight, and its front fit-in visor is removable. The large size fits heads from 54 to 61 centimeters (approximately 21 to 25 inches). This helmet is stylish enough for both men and women, and is available in five elegant colors: Matt Black, Blue White, Pink, Silver White, and Red White. MSRP: $74.99. For more information about Limar helmets, as well as other quality bicycle products, including Elite accessories, Ozone sports creams, Retro mirrors, Selle Italia saddles, and Sweat GUTR sweatbands, please visit your favorite bicycle dealer, or contact ProNet Cycling at (800) 279-3793 and info@pronetcycling.com. Visit us online anytime at www.pronetcycling.com.